Asp Form to Database and Mail is an extension for Dreamweaver that allows to process a form, automatically save it in a database table and simultaneously send an email with a copy of these data to the email address of your choice. You can create any form you like, then simply insert the extension ASP Form to Database, which will automatically identify the form fields; it will also automatically create the table in the database and respective fields, thereby minimizing your work. The currently supported databases are: MSAccess (Microsoft Office Access) and MSSQL (Microsoft SQL Server), as well as databases whose queries are compatible with those of MSAccess that are accessible through ODBC connections. Accepts connections OLEDB / ODBC (automatic configuration), primarily designed for MSAccess and MSSQL databases. Distributed as an extension to Dreamweaver: no need to deal with the code. If you wish to receive files sent as attachments to your forms, writing permissions must be set on the folder "HDWFormToDatabase/saved_forms". 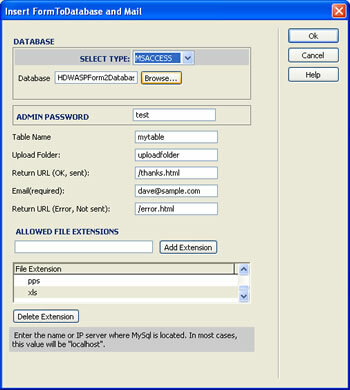 If you use MSAccess databases, please note that the folder containing the database should also have writing permissions. Note: If your form includes sending files note that most web servers limit the size of these files to about 2 MB (sum of all files of the form). Note: This demo is based in PHP scripts because is shared with the PHP version, but it contains the same features than the ASP version. You don't need PHP installed in your web server in order to use this product. To see an example/visual-tutorial of use you can check this Video / Sample. You can read the installation details in the "Installation" section below. You can read more about other details in the "Notes" section below and in our FAQ. For questions not covered by these notes & resources you can contact our support service. You can find more about in our ASP Form to Database - FAQ. Access the extension from Dreamweaver>> Menu>> Commands>> Insert ASP FormToDatabase. Use the option Dreamweaver >> Menu >> Commands>> Insert ASP FormToDatabase. Table Name: the name of the table where the form will be saved. You do not need to create this table in the database, just put the name here and the table will be created automatically when you receive your first submitted form. Upload Folder: the name of the folder where the files, uploaded via the form, will be saved. This folder will be located in "HDWForm2Database/saved_forms" and 5 additional characters will be added to its name automatically, for added security. Return URL (ok, sent): here indicate the URL of the page where the user will proceed after submitting the form successfully. Usually it is a confirmation page where the user thank you for having submitted the form. Note that you must create this page first. Allowed file extensions: for your security, you can choose the kind of files you wish to accept, for example: doc,. Pdf,. Jpg, etc. When you click the "OK" button, the required files will be generated in the folder HDWASPForm2Database. Important! Remember to upload all those files onto your web server. To receive attachments with your forms, you will need to set writing permissions on the folder "HDWASPFormToDatabase / saved_forms". If you use MSAccess databases note that the folder containing the database should be writeable. This utility, as we already mentioned, allows you to list and search the data from received forms, as well as edit and delete these data. It does not require additional configuration, both tables, fields etc will be automatically identified. To access, use the following address: http://your-web-site/HDWASPForm2Database (remember to replace "your-web-site") with the appropriate domain name of your website. Here you can view a demo similar to the one mentioned.